Discussion in 'Online Casino Promotions' started by Marina, Jun 20, 2016. Do you consider yourself a trivia whiz, a football fan or a lover of online gambling? If you’re just one of these, Guts Casino has the promotion just for you. Welcome to the Guts Casino Euro 2016 casino trivia competition! 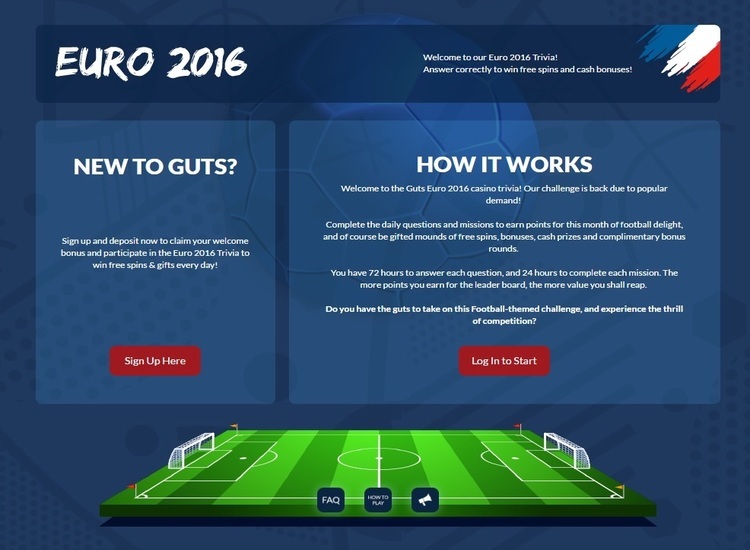 This online gaming site is inviting you to complete the daily questions and missions in order to earn points during the period of the Euro 2016 football even. Guts Casino will give players 72 hours to answer each question put to them, while 24 hours have been dedicated to complete a mission. Are you up for the challenge? will climb the leaderboard and the more rewards you will win. with a timer so that you can see their position on the trivia calendar. Take note that these questions are time sensitive, and you want to answer them as quickly as possible. The questions are in multiple-choice format, and you are only given one opportunity to pick the right answer, so don’t be hasty. If you answer an answer correctly, you will be rewarded with five leaderboard points. In addition, you will be given a gift (no deposit free spins) after answering correctly. will need to have made one deposit into your Guts Casino account (at any time) since you registered for the Euro 2016 Trivia promotion. tarting 00:00 CET every morning, and you have 24 hours to complete it. Remember that you can take part in the missions even if you have not answered the trivia question successfully. Earning points pushes you automatically up the leaderboard which will run from now until July 9th, 2016. The leaderboard is updated every day and its final status will be announced on July 12th 2016. Austria, Finland, Malta, the Netherlands, New Zealand, Norway, Sweden, Switzerland.